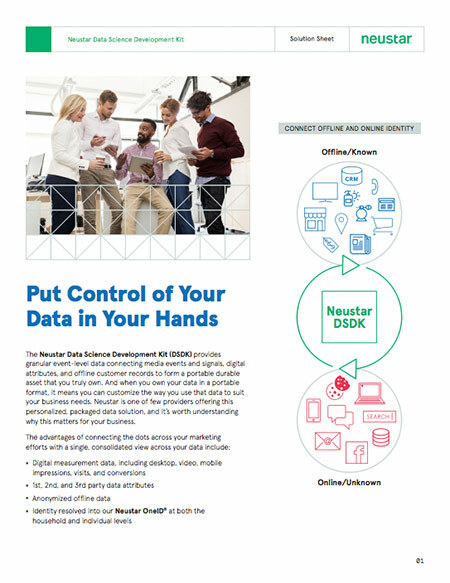 The Neustar Data Science Development Kit (DSDK) provides granular event-level data connecting media events and signals, digital attributes, and offline customer records to form a portable durable asset that you truly own. And when you own your data in a portable format, it means you can customize the way you use that data to suit your business needs. Neustar is one of few providers offering this personalized, packaged data solution, and it’s worth understanding why this matters for your business. Portable: The DSDK provides raw, event-level data delivered daily. These files contain data related to your campaign’s impressions, engagements, and conversions, as well as relevant site activity. Load DSDK data into your own data science environment for customized reporting, analysis, and attribution. Owned by You: Neustar puts your data in your own hands, thus empowering organizations to build their own intelligence. Refine audience segmentation, adjust media allocation, and boost marketing strategy with real-time access to your data. Centralized Intelligence: A holistic, neutral, and unbiased view of campaign, media, and audience performance across all channels (online and offline) from a single source of truth. Neutrality: Improve audience segmentation, media allocation and spend while retaining full confidence in data neutrality. Unlike many other providers, Neustar has no vested interest in media or distribution partners. Streamlined: Don’t waste your time aggregating complex and unruly data. Neustar has done the dirty work to consolidate and normalize across all data sources allowing you to spend more time analyzing and less time trying to connect the dots. Greater Scale: Higher match rates to households and individuals. Connected Customer Experiences: Use everything you know about a person to inform all of the decisions and personalized interactions that you are delivering across all touchpoints.